When this Mosman client decided to renovate and rejuvenate their outdoor entertaining area, they wanted to replace the tired old brush fencing that surrounded their pool with a glass fence to improve the aspect and appeal of the yard overall. 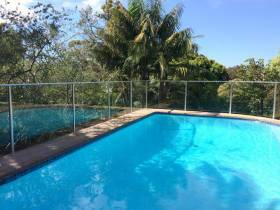 Gateway Fencing has been Sydney’s premier fence contractors for more than two decades. For more information on how we can design and install your new custom garden fence, driveway gates or glass pool fencing, contact us for a free, no obligation quote. The First Choice In Fencing. Gateway Fencing is Sydney's premier fencing contractor. We design and install all types of custom fences and gates on commercial and domestic properties right across the Sydney area.